Stanford University　School of MedicineStem cells are highly conserved biological units of development and regeneration. Here we formally demonstrate that stem cell lineages are also legitimate units of natural selection. In a colonial ascidian, Botryllus schlosseri, vascular fusion between genetically distinct individuals results in cellular parasitism of somatic tissues, gametes, or both. We show that genetic hierarchies of somatic and gametic parasitism following fusion can be replicated by transplanting cells between colonies. We prospectively isolate a population of multipotent, selfrenewing stem cells that retain their competitive phenotype upon transplantation. Their single-cell contribution to either somatic or germline fates, but not to both, is consistent with separate lineages of somatic and germline stem cells or pluripotent stem cells that differentiate according to the niche in which they land. Since fusion is restricted to individuals that share a fusion/ histocompatibility allele, these data suggest that histocompatibility genes in Botryllus evolved to protect the body from parasitic stem cells usurping asexual or sexual inheritance. 5 Center for Stem Cell Biology and Regenerative Medicine, The Institute of Medical Science, The University of TokyoMetabolic syndrome is a major risk factor of cardiovascular events, and adipose tissue obesity based on chronic inflammation play a central role. To assess dynamic interplay between multiple cell-types in inflammatory diseases, in vivo imaging technique based on single- and multi-photon microscopy was developed. Imaging revealed close spatial and temporal interrelationships between angiogenesis and adipogenesis in obese adipose (Nishimura et al, 2007 Diabetes). In addition, increased leukocyte- platelet- endothelial cell interactions in the microcirculation of obese adipose were observed, a hallmark of inflammation (Nishimura et al, 2008 JCI). We also found that large numbers of CD8+ effector T cells infiltrated into obese adipose. Infiltration by CD8+ T cells is essential for the initiation and development of adipose inflammation (Nishimura et al, 2009 NatMed). By our in vivo imaging technique, multiple cell types are specifically visualized (b), and thrombus formation was induced by laser irradiation which cause ROS production inside the blood vessel (c). Using this technique, we revealed Lnk/Sh2b3 regulates integrin alpha-IIb-beta-3 outside-in signaling in platelets leading to stabilization of developing thrombus in vivo (Nishimura et al, 2010 JCI). In addition, we established human iPS-derived platelets, and tracked them in mice to elucidate its function in vivo (Takayama & Nishimura et al, 2010 JEM). We confirmed injected platelets circulate, and contributed to the thrombus formation in vivo, indicating the clinical usefulness of this strategy for future. In addition, we have succeeded in visualizing T cells, myeloid cells, megakaryocytes, platelets etc. in bone marrow with high time and spatial resolution. We transplanted GFP+ T cells into normal, irradiated B6, Rag2, and BDF1 mice and tracked the T cells in vivo to elucidate the functional role of T cells in bone marrow stroma (unpublished data). Our results clearly demonstrated the power of our imaging technique to analyze complex cellular interplays in inflammatory diseases, especially parenchymal and stromal cell cross talks, and to evaluate new therapeutic interventions against them. Division of Stem Cell Therapy, Center for Stem Cell Biology and Regenerative Medicine, The Institute of Medical Sciences, The University of TokyoThe existence of liver stem/progenitor cells derived from early-fetal livers (embryonic day 9.5 and 10.5 in mice) has not been fully elucidated, because culture system suitable for these cells has not yet been well defined. 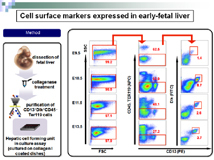 We established a new culture system for analyzing the phenotypes of early-fetal liver stem/progenitor cells. Single CD13+Dlk+ cells purified from E11.5 and E13.5 mid-fetal livers, but not those purified from E9.5 and E10.5 early-fetal livers, formed individual large colonies on collagen type-I coated dish. 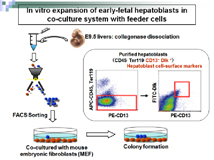 In contrast, single CD13+Dlk+ cells purified from both early- and mid-fetal livers formed individual large colonies in the co-culture system with mouse embryonic fibroblast cells used as feeder cells. 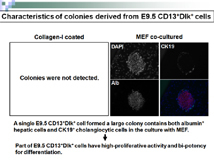 Colonies derived from early fetal CD13+Dlk+ cells consisted of both albumin-positive hepatocytic cells and cytokeratin 19-positive cholangiocytic cells, indicating that these cells have the ability of liver stem/progenitor cells. In addition, inhibition of Rock or non-muscle myosin II (the downstream component of Rock) signal was necessary for effective expansion of E9.5 CD13+Dlk+ cells, but not for E13.5 CD13+Dlk+ cells. In sorted CD13+Dlk+ cells, expression of hepatic marker genes, albumin and a-feto protein, were increased during fetal liver development. Expression of cytokeratin19 and Sox17, endodermal progenitor cell markers, was the highest at E9.5 but was decreased dramatically thereafter. In this study, we show that CD13 and Dlk are common cell surface markers of stem/progenitor cells during early- to mid-fetal liver development, however the property of these cells gradually change as the developmental stage proceeds. Expansion of early-fetal liver stem/progenitor cells requires the interaction with mesenchymal cells and the inhibition of Rock-myosin II signal pathway. okyo Adoptive immunotherapy is a promising approach to cancer immunotherapy that circumvents some of the limitations of active immunotherapy. However, its effectiveness is often hampered by exhaustion of antigen-specific T cells. To address this issue, we utilized induced pluripotent stem (iPS) cells generated from human peripheral T lymphocyte (T-iPS cells). Rearrangement of T-cell receptor (TCR) genes was maintained in these T-iPS cells which, because T-iPS cells have unlimited self-renewal capacity, could be expanded ex vivo. These T-iPS cells were then re-differentiated into CD3+TCRab+ functional T-lineage cells in vitro with higher efficiency than was possible for embryonic stem cells, iPS cells derived from fibroblasts, or cord blood cells. Complete monoclonality of productive TCR transcripts, transcribed from the genome inherited from the original progenitor T cell, was observed in re-differentiated T-lineage cells: No signature of de novo TCR gene rearrangement could be identified. 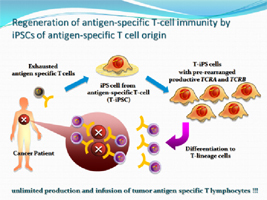 The technology described opens a way for effective T-cell therapy with antigen-specific monoclonal TCR. Division of Stem Cell Therapy, Center for Stem Cell Biology and Regenerative Medicine, The Institute of Medical Science, The University of Tokyo [Background] Hematopoietic stem cell transplantation (HSCT) represents a curative treatment for various disorders. 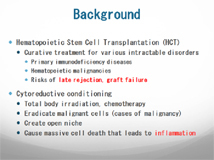 Most HSCT requires cytoreductive conditioning such as total body irradiation (TBI) and/or chemotherapy to ensure engraftment of HSCs by emptying recipients’ marrow niches. Our preliminary experiments, however, revealed that TBI could induce local inflammation within marrow environment. 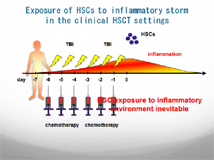 Of note is that conditioning regimens widely used in the current HSCT settings are compatible with HSC exposure to inflammatory storm in post-irradiation bone marrow (BM). 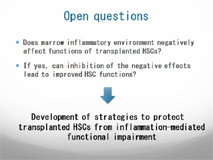 Since certain inflammatory cytokines have been shown to affect HSC functions in in vitro, we sought to investigate what effects irradiated BM environment would have on transplanted donor HSCs using murine transplantation models. [Methods and Results] We first tested whether infusion of HSCs at varying timing post TBI would affect transplantation outcomes and HSC functions. To this end, fifty HSCs (CD34-KSL cells) obtained from Ly5.1-B6 mice were transplanted into lethally irradiated Ly5.2-B6 mice with 1 x 106 competitor Ly5.1/5.2-B6 BM cells at day 0, 3, or 5 post irradiation. No mice survived in the group that received transplants 5 days post irradiation, indicating insufficient HSC engraftment and hematopoietic reconstitution. Although hematopoiesis reconstituted in long term survivors was comparable between another two groups (d0 and d3), we found significant difference in donor HSC ability when tested in a competitive repopulation assay using Ly5.1-KSL cells sorted from primary recipients: Test HSCs obtained from mice transplanted 3 days after TBI showed poor secondary reconstitution ability, suggesting alteration of pre-engraftment HSC functions depending on transplantation protocols. We then tested whether in vivo short-term exposure of HSCs to irradiated BM environment would have negative effects on HSC functions. Test HSCs (400 cells) from Ly5.1-B6 mice were transplanted into Ly5.2-B6 primary recipients at varying time points (day 0, 1, 2, or 3) after TBI. Approximately 24 h later, BM samples were subjected to a competitive repopulation assay to assess secondary reconstitution ability in test HSCs that homed to irradiated BM environment. Consequently, test HSCs that were exposed to day 2 BM post TBI showed marked impairment in their long-term reconstitution ability. 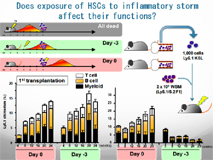 When “BM-homed” HSCs were enumerated 24 h after infusion, we found modestly impaired HSC homing to day 2 BM compared to day 0 BM, indicating negative effects on HSCs transplanted during a peak phase of inflammatory storm. 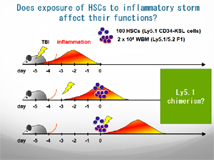 Among several inflammatory cytokines tested, one cytokine inhibited colony formation in a dose-dependent manner in liquid culture using purified HSCs. When in vivo HSC exposure to irradiated BM environment was tested using KO mice as primary recipients, significant recovery of HSC ability was observed, indicating a major role for this inflammatory cytokine in the HSC-inhibitory effect within the irradiated host tissues. We finally sought to test if blocking of cytokine signaling in HSCs at a peak phase of inflammation could lead to better transplantation outcomes. We utilized the peptide previously shown to block cytokine signaling, and confirmed that pre-incubation of HSCs with this molecule did suppress reactive oxygen species production in HSCs. Studies are ongoing to assess beneficial effects of this “protection” measure on HSCs upon transplantation into irradiated recipients. [Conclusion] We demonstrated that inflammatory response in BM environment 2-3 days after irradiation had a negative effect on donor HSCs regarding both homing efficiency and secondary reconstitution ability. These findings provide important implications for developing the measures that enable HSCs to escape from this inhibitory effect to achieve far more improvement in clinical HSCT outcomes. Laboratory of Developmental Stem Cell Biology and Division of Stem Cell Therapy, Center for Stem Cell Biology and Regenerative Medicine, The Institute of Medical Science, Th e University of TokyoDNA methylation is an essential epigenetic process in organogenesis. Whether activity of de novo DNA methyltansferase 3a (Dnmt3a) and/or Dnmt3b is required for development of tissue-specific stem cells is poorly understood. Here we report that Dnmt3b but not Dnmt3a is essential for establishment of self-renewal potential in developing hematopoietic stem cells (HSCs). 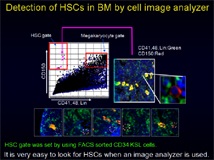 We examined HSCs in the fetal liver from Dnmt3a- or Dnmt3b-deficient mice. 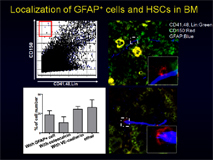 Multilineage differentiation potential was detected in Dnmt3a- or Dnmt3b-deficient fetal HSCs. Long-term repopulation after primary and secondary transplantation was severely impaired in Dnmt3b- but not Dnmt3a-deficient fetal HSCs. We have been interested in molecular basis of self-renewal potential. 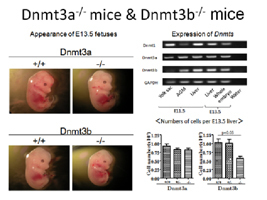 To address this issue, Dnmt3b-deficient mice may serve as a good model because Dnmt3b-specific methylation sites might be associated with self-renewal potential. DNA methylation is considered to play a role in the regulation of gene expression as well as in the maintenance of genomic integrity. Microarray analysis showed that only the limited number of genes was misexpressed in Dnmt3b-deficiet HSCs. Dnm3b-specific methylation sites were identified by PCR-based genome-wide DNA methylation analysis. To our surprise, there was no apparent link between expression changes and methylation changes in promoter regions. Changes in gene expression alone may not account for impaired self-renewal potential. Stem Cell Bank, Center for Stem Cell Biology and Regenerative Medicine, The Institute of Medical Science, The University of TokyoHuman induced pluripotent stem cells (hiPSCs) are a potentially abundant source of blood cells, but how best to select iPSC clones suitable for this purpose from among the many clones with heterogeneity that can be simultaneously established from an identical source is not clear. Using an in vitro culture system yielding a hematopoietic niche that concentrates hematopoietic progenitors, here we show that the pattern of c-MYC reactivation after reprogramming influences platelet generation from hiPSCs. During differentiation, reduction of c-MYC expression following initial re-activation of c-MYC expression in selected hiPSC clones was associated with more efficient in vitro generation of CD41a+CD42b+ platelets. This effect was recapitulated in virus integration-free hiPSCs using a doxycycline-controlled c-MYC expression vector. In vivo imaging revealed that these CD42b+ platelets were present in thrombi following laser-induced vessel wall injury. In contrast, sustained and excessive c-MYC expression in megakaryocytes was accompanied by increased p14 (ARF) and p16 (INK4A) expression, decreased GATA1 expression, and impaired production of functional platelets. These findings suggest that the pattern of c-MYC expression, particularly its later decline, is key to producing functional platelets from selected iPSC clones. This paper is being published soon in the Journal Experimental Medicine.